It's crazy to think that just over four months ago I didn't have any followers, and I never thought that anybody would take much interest in my blog, but here I am today, 114 posts and 21,500 page views later, reaching 500 followers! I am so thankful for all the support I have gotten from my readers, without all your comments, feedback and encouragement, I don't even know if I would still be blogging now. Please make sure you read the rules as I would hate for anybody to have to be disqualified! 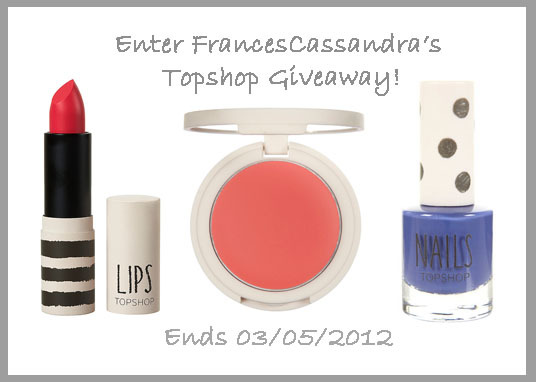 The prize is a Topshop lipstick, blush and nail polish of your choice! If you would prefer, the blush or lipstick can be swapped out for an eyeshadow. Make sure your choices are a part of the permanent line, and if possible, do a little research or make your choices in store, as there is a wider range of colours in store than on the Topshop website! This giveaway will run for exactly four weeks, so it will end at 00:00 BST on May 3rd, 2012. New followers are more than welcome to enter, but if you are entering with "giveaway accounts", your entry will be disqualified. This giveaway is for legit readers. To enter you must be a follower of my blog via GFC and also comment below telling me what kind of posts you enjoy reading most on my blog or what you would like to see more of. You can also earn up to seven extra entries! Fill in the Rafflecopter form below to enter my giveaway! *DISCLAIMER: This is not a sponsored giveaway. The prizes will be purchased using my own money. Love your outfit posts and week in photo's! Congrats on 500 followers, and thanks for such a lovely giveaway! I love reviews and I'd like to see a post with products you consider as fails! you've only done a few some far but i love seeing your OOTDs! I'd love to see hauls, can't get enough of hauls. I love your Wednesday Wishlists and Week in Instagrams. Thanks for putting this together, it's very generous of you! I love your product reviews! well done on reaching 500 followers sweetie, you deserve each and every one. i love to read hauls and ootd/ootn! but i also like your reviews. I like reading most of your posts but i enjoy reading your reviews & hauls! My wife loves your blog, and I am trying to win this for her while she is out of town caring for her dad. She uses your site for product reviews! I like nail polish posts, but your blog is great anyways! 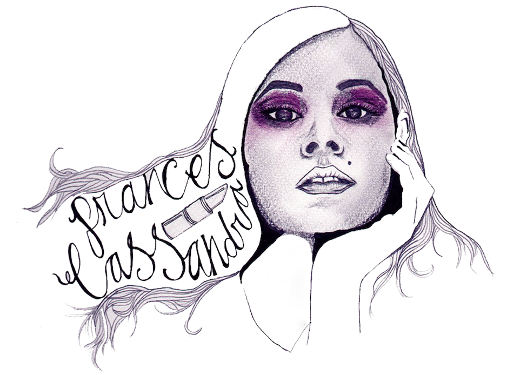 Hi Frances, loving the blog! This is a really generous giveaway! Could you just please explain what GFC is?? Thanks! Congrats on your 500 followers! Congrats on the followers my lovely, you deserve them all! I love to see hauls and just to say i do publisize giveaways on my blog but its also for beauty... As you can see from many of my posts.. I'd like to see more product reviews! Haul posts, NOTDs and comparisons! Love your blog and congrats! congrats on 500 followers! i would like to see more reviews! I would love to see more make up and nail art posts! Hello, just realised I forgot to comment here about the types of blog posts I most enjoy. More reviews & of course (at least, I'm honest xD) giveaways <3! I love all your posts :) but hauls are my favourite things to read. I'm so nosey, i love seeing what other people buy! Honestly i really love when bloggers find dupes of really expensive products and find a cheap alternative! nothing like finding something similar and knowing its half the price, etc! like if you for e.g. named all your fave lippies high end /reasonably expensive and found the most similar in match in drugstore would be great, etc etc and eyeshadows..the list goes on! Your blog is great and it goes better little by little. CONGRATS!! more giveaways- like this awesome one! I really want to see all your pair of shoes!! !post them! I love the reviews. Are really usefull. i like your "of the day" posts..makeup, outfit. :) congrats on the followers! I like your clothing hauls the most! I like your outfit and jewellery posts. We have similar taste in jewellery. I love your reviews! I love getting an idea about a product before I try them so I know what to expect, so I'd love to see more of those. I totally love your OOTD and Week in Instagram. You have a very cute style!! More hauls and nail polish reviews! They're so helpful! Reviews and hauls are the best! i would like to see more outfit of the days. i like to view most review! I love reading outfit posts! i'd love to see some more reviews! always the outfits, what style my dear! I also tried to remove nail polish with foil and it worked! Great post! I don't follow you from the beginning, but I read all of your posts. I love giveaway posts. :-) Lubka K.
I love reading reviews! they are really helpful! And I'd also see mooore reviews and so-super-hauls O_o ! I'd like to see more reviews. love the diy posts!!!!!! they are my faves! Personally I love your fashion posts and your wishlists are always fab too. I like swatches and OOTDs ! i love OOTD's...nailswatches... and instagrams are cool too! i love your OOTD posts! Congrats and I love OOTD'S! I love reviews of indie polishes and other beauty products! I love product reviews, they really do influence me. My favorite posts are product reviews, I also like haul posts. I'm new here, but from looking around I would say I love your reviews! I would love to see more product reviews. I like product reviews the best because they help me decided on what to buy. Welldone on reaching 500 follower's!